Preheat oven to 350F spray a 13x9 inch baking pan with nonstick baking spray with flour. In a large bowl, beat cake mix, 1 ¼ cups champagne, oil, and egg whites at medium speed with a mixer until smooth. Pour batter into prepared pan. Bake for 15 to 20 minutes or until a wooden pick inserted in center comes out clean. Cool in pan for 1 hour. In a large bowl, beat cream cheese, butter, and jam at medium speed with a mixer until combined. Beat in remaing 2 tablespoons champagne. Gradually beat in confectioners sugar, beating until mixture is smooth. Crumble cooled cake into small pieces, and gradually add to cream cheese mixture, beating just until combined. Cover and refrigerate for 8 hours. Line baking sheets with wax paper. Roll cake mixture into 1 inch balls. And place on prapared pans. Using 2 forks. 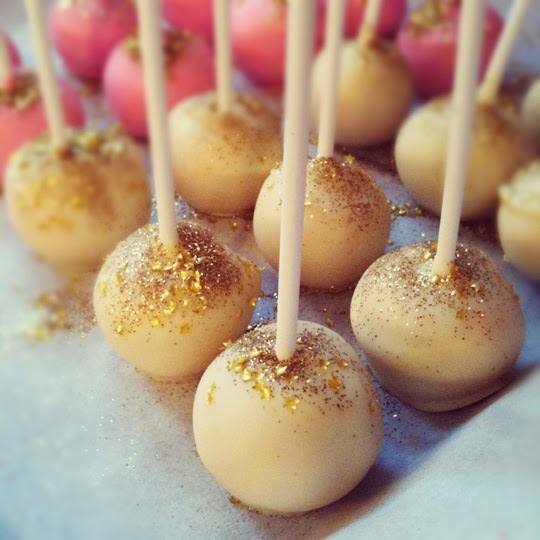 Dip cake balls into candy coating, letting excess drip off. Return to pan, and sprinkle with edible glitter, if desired. Let coating harden. Store covered in refrigerator for up to 1 week.